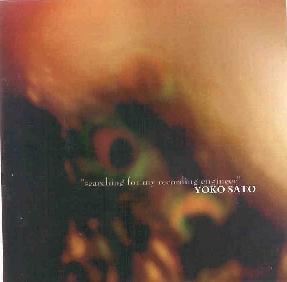 Yoko Sato - "Searching For My Recording Engineer"
Searching For My Recording Engineer features Yoko Sato blasting out solo electric guitar improvisations characterized by brain blistering chords and feedback, some of which is so piercing that they're sure to put out your windows. This is definitely sonic assault stuff and not for the faint of heart. But while there isn't a shred a ambience in Sato's playing, she does in some mindfucked way achieve the same result by generating layers of drifting, screaming and pulsating waves of aggression. The parts that grabbed me the most are the acid-noise freakouts that seem to dwell in an alterna-dimensional Hendrix/Heino vortex. Kind of an avant-garde noise-psych take on the classic rockin at the Fillmore guitar at center stage solo. So while Sato is firmly in the experimental improv realm the music is loaded with classic acid-rock elements. "Guitar and Voice Improvisation" is a somewhat different track which (obviously) includes voice in the form of Sato's anguished moaning and shrieking against raking power chords and dense walls of sound. The CD is only 35 minutes long which is more than enough time for Sato to make her sonic statement. Fans of harsh free-improv who haven't left their Hendrix days behind will find lots of interesting sounds and ideas expressed in Sato's music.